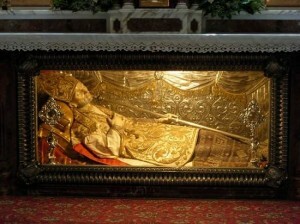 Saint Roch (+1327) is a patron of the sick. He knew first hand the sufferings sick people face, and how the illness, though a cross, makes a bridge to something greater. Saint Roch was a layman who followed the good example of Saint Francis of Assisi, and it is said that he was a member of the Secular Franciscans though there are no records attesting to this and yet the Franciscans observe his liturgical memorial on August 17. Catholic healthcare was emboldened in the time following Roch’s death with various hospice works and groups gathering as a confraternity to assist the professionals and families. Many were healed of their diseases through Saint Roch’s intercession. Blessings on my friend, Father Matthew Rocco Mauriello and his parish, Saint Roch, Greenwich, CT.
Today we remember Saint Arnold of Soissons (1040–1087), the patron saint of hop-pickers and beer brewers. Arnold, born in Belgium, founded the Abbey of St. Peter in Oudenburg. At the abbey, he began to brew beer, as essential in medieval life as water. He encouraged local peasants to drink beer, instead of the contaminated village water, due to its “gift of health.” During the process of brewing, the water was boiled and thus, unknown to all, freed of pathogens. As one would have thought, a Benedictine monk perfected beer making. 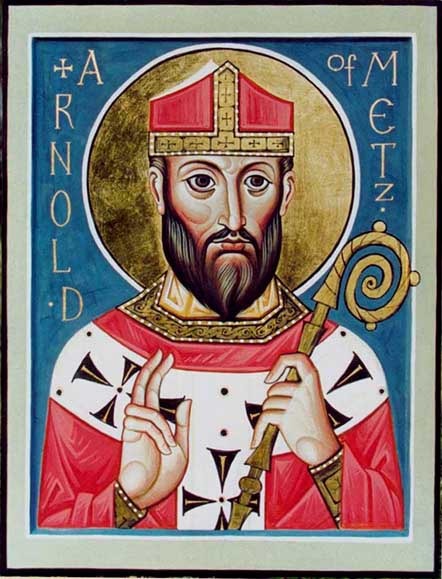 Saint Arnold did good work for the health of his people through brewing beer. Saint Arnold, pray for hop pickers, beer brewers, and for all of us who enjoy a good beer. O God, who constantly raise up in your Church new examples of virtue, grant that we may follow so closely in the footsteps of the Bishop Saint Alphonsus in his zeal for souls as to attain the same rewards that are his in heaven. The following text is taken from a sermon by Saint Alphonsus Liguori (September 27, 1696 – August 1, 1787), bishop, founder of a religious order and a Doctor of the Church. You and I would do well to take stock of how much we really live a life of virtue and how much we are concerned with our final end, hopefully, heaven. In me, I want you to see your own body, your members, your heart, your bones, your blood. You may fear what is divine, but why not love what is human? You may run away from me as the Lord, but why not run to me as your father? Perhaps you are filled with shame for causing my bitter passion. Do not be afraid. This cross inflicts a mortal injury, not on me, but on death. These nails no longer pain me, but only deepen your love for me. I do not cry out because of these wounds, but through them I draw you into my heart. My body was stretched on the cross as a symbol, not of how much I suffered, but of my all-embracing love. I count it no loss to shed my blood: it is the price I have paid for your ransom. Come, then, return to me and learn to know me as you father, who repays good for evil, love for injury, and boundless charity for piercing wounds. 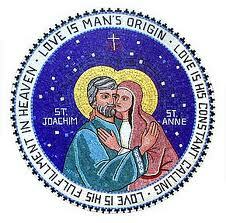 Today, is the liturgical memorial of Saints Joachim and Anne, the remembrance of Our Lord’s maternal grandparents. Here we are able to relate to the humanity of Jesus, and not just His divinity. The genius of God that we are able to trace a genealogy! While the secular world has a grandparents’ day, the Church has one too. Today. The feast of Saints Joachim and Anne could serve well as an occasion to recall the fact of our grandparents, and also be the occasion to consider the grace of having an extended family. I am grateful for both the paternal and maternal grandparents God gave me. It was a privilege to have both sets of grandparents until 1987, when my paternal grandfather died; I was further graced by having a grandmother in my life until I was 33. Thanks be to God! My grandparents were wonderful and brilliant people who nurtured me and the family. It was my maternal grandmother, Marion, who taught me my prayers. Grandparents can be great models of a life of discipleship. The Ordinary Form of the Latin Church observes today as the feast day for Joachim and Anne while the Extraordinary Form celebrates today as Saint Anne’s feast and then Saint Joachim on August 16; the Byzantine Church observes the feast on July 25 and claims the feast being observed as early as AD 550; in Rome some say the feast was observed in the 8th century. The Orthodox Church honors Anne with the title of “Forebearer of God.” Catholicism is a historical religion but here we have not concrete evidence to give except to say it is the sacred tradition of the Church that what liturgically recall today is in fact true. This is so because we believe that not only does God act reasonably but He acts in history. 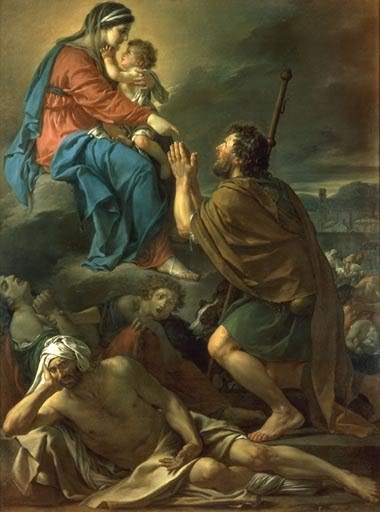 What we know about Saints Joachim and Anne does not come from the canon of sacred Scripture (the Bible) but from a source outside the approved biblical narrative in a text called the Protoevangelium Jacobi –or, the Gospel of James– written about AD 150-170. This text is not terribly reliable but it is referenced by the Church. 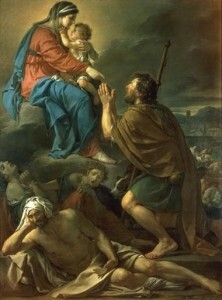 In many ways Joachim and Anne reflect the experience of Abraham and Sarah, the narrative of Samuel and his mother Hannah (I Kings), and later John and Elizabeth. In Hebrew, Anne is translated as Hannah. I am happy to say that the image above is that of a friend, Adrienne M. Keogler.